The Hissing Phial is an apothecary at the Mistral docks. 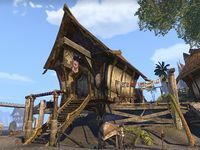 It is a Khajiit-style plantation shack with no doors or windows. An alchemy station is situated on the right-hand side from the entrance. A dye station is immediately on the left. Valashi's desk is across the room with an Alchemy For My Apprentice manual on it and the notorious ledger. Behind the desk there is a worktable with an alchemical equipment. A shelf above it can hold quite a few drinks or solvents. Beside the worktable is a wardrobe. Boatman's Beauty — An outfit station in Mistral.